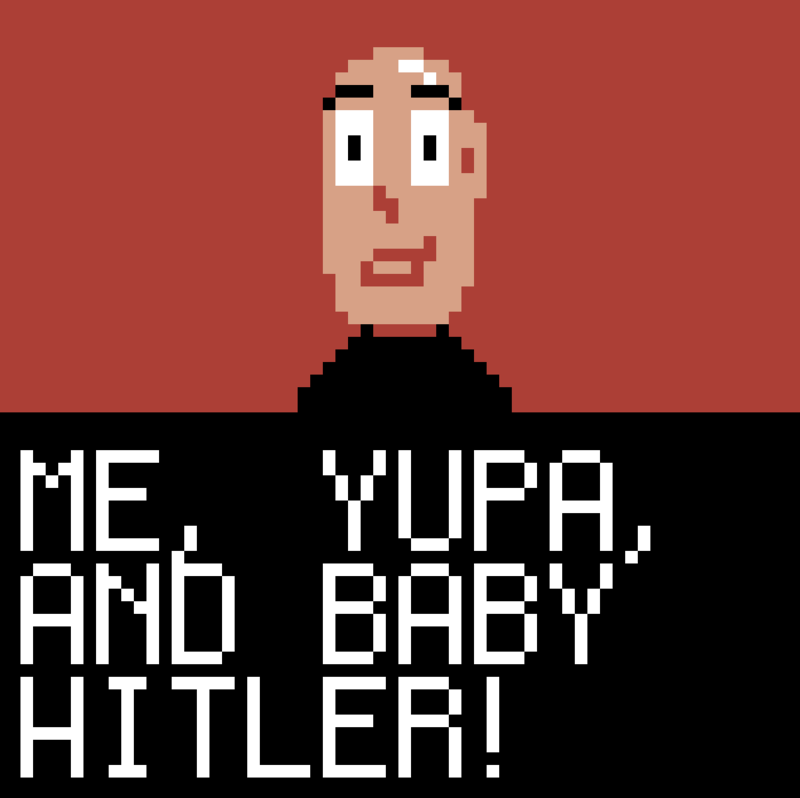 In this blog post, I will discuss about the process I went through to develop this game and discuss in details all 4 solutions for the game Kill Baby Hitler, and this will contains spoilers for the game. So if you haven't played it yet, please try it out first! I was really looking for some kind of interesting debate about whether or not Killing Baby Hitler would be the moral choice. I have my own opinion on it, and I was curious to know what people on the left generally thought about it. I was guessing that they would be against Killing Baby Hitler because they are also against the death penalty. Now that video was complete garbage. Instead of debating the idea, they just spend the whole time mocking the fact that Ben Shapiro talked about it, made it appear as if the answer is supposed to be obvious, and their attempt at humor made me want to cringe. I'm not even sure if they answered the question. I think they were playing this game of dodging to answer the question because saying it out loud that you would "kill baby hitler" would be very uncomfortable. Or I'm just guessing that it was an automatic response of taking the opposite position of someone on the left, mocking him for thinking that way, and they would have defended the answer if it came from a leftie. Anyway, right away I thought of making the game, so that I can trigger an actual discussion about this topic. The idea was clear in my mind. The game would put you immediately in the to the situation where you had to make the decision: To kill or not to kill baby hitler. I did ponder for a few minutes if I should make some actual puzzles before that (so that it looks more like an actual game). I decided against it mostly due to time constraints, but also I really didn't want to distract from the main point. I was really hell bent on figuring out if people were more likely to kill baby hitler or leave him alive. I thought of making some kind of system where you would no longer to replay the game once you made your choice (unless you cleared your browser cache). I also thought of using some kind of server system that would log each person's response, and have them go through a poll to figure out if they were democrats or republicans. That was completely scrapped naturally, because there was something painfully obvious: Everyone would definitely want to try both endings no matter what, and the first one might not even be their preferred choice! I'm glad I didn't go that route. So really, the game wasn't going to give you my answer. But it's ok, I wanted more for people to think about it, about the philosophical and logical implications of such act. I also expected some comments where people would share their view of the dilemma, so that was enough for me. So, it was time to make the game! When it's time to make a game, I usually don't just do it. I first hop on https://indiegamejams.com and try to see if there's an interesting jam to join. This time, I did already have a story in mind, but some jams also add technical restrictions which make for an interesting challenge. 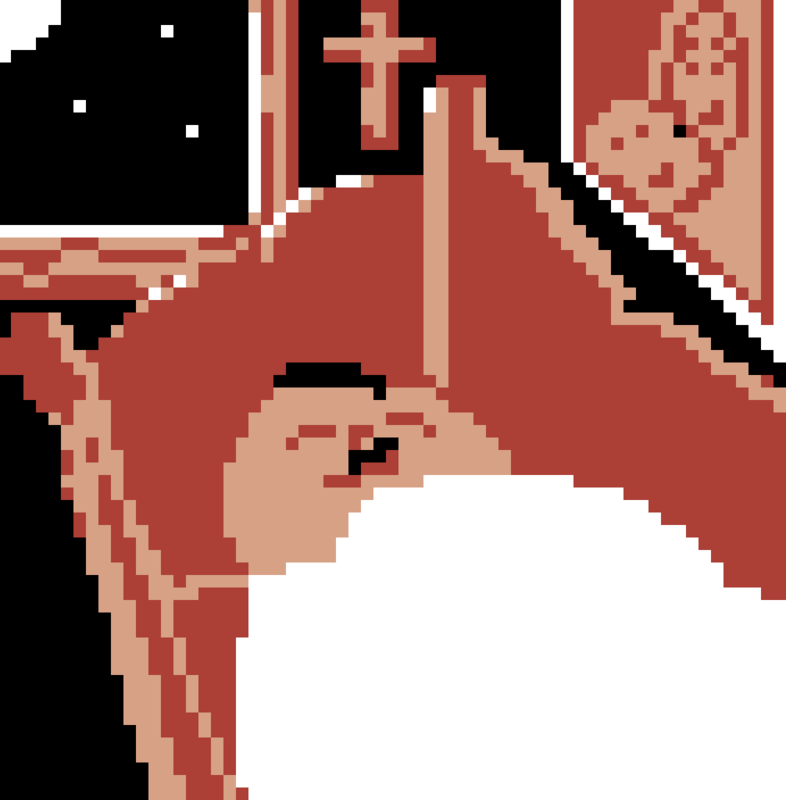 I settled on this pixel jam that forced a 64x64 screen resolution and a 4 color palette. The 4 color one was quite unusual, but I think having restrictions help to make a game a bit more unique. I also found a few other jams where my game would perfectly fit the theme. The sound was encouraged to be retro, so I guess Garage Band was out of question. I actually learned a new tool that got suggested: BeeBox. It turned out to be very easy to use, even to the point where I was putting random notes and it was making somewhat decent music. (The time travel sequence and the alien chat were both produced with completely random notes!). Now let's talk about the endings. SPOILERS AHEAD. I originally thought of three endings. For some reason, I had the idea of that stupid alien ending pretty early. The idea of the sheep ending came later. But first, I had to do the basic endings. Each ending came with its own color, which reflects what happens to the player. So, in this ending, your action caused an alternate version of 2019. You see, the events of World War 2 were so significant that considering that it doesn't happen, you can guarantee that the future is completely different than what it would originally be, and there's almost no chance that you would be born in the same situation. So that's what happens, the future you came from no longer exists, and so do you. Is it a utopian future, as humanity never experienced a setback caused by World War 2? Possibly. But one could imagine another scenario. The horrors of World War 2 got averted, humanity never knew what such horror is about and humans got a little more careless about society and later caused another similar or worst event. In truth, nobody has any idea what would happen. This ending reflects that reality: You can imagine a happy ending, but you can't guarantee it, and you would never know if that really happen. You choose to aim your gun away from the baby and shoot. Pulling the trigger the gun does bring you back to the future, as the agent mentioned. The historic consequences are obvious. Since you did not change history, it occurred the same as it did and nothing has changed. This is a choice you make: to not alter history, to not mess with time. Probably the most important reason is that you didn't really want to murder a baby! Well this puts a lot of weight on morality vs utility. Killing the baby could have saved millions of lives. At the same time, you're aware that changing the course of history would produce a chain of events that you could not predict, and it could also make the future much worst. Perhaps you watched this niche sci-fi movie with Ethan Hawke called Predestination. If you haven't seen it, you should definitely check it out. It does put some perspective on traveling back in time to prevent big tragedies from happening. I won't say more because I don't want to spoil it for you. Anyway, you have not only failed the mission, but you essentially chose to let history happen as it did. Some do not see eye to eye with you, especially the agent who hired you. The discussion that follows is very uncomfortable from what you can tell. The agent's remarks are very sarcastic and ominous. There's hidden meaning behind every single words. At the end, it seems that you can expect to be killed by the agent, yet you say "Thanks" as the agent lets you go. Perhaps you really believed that you would get away after ruining the mission, or perhaps you just accepted your fate. 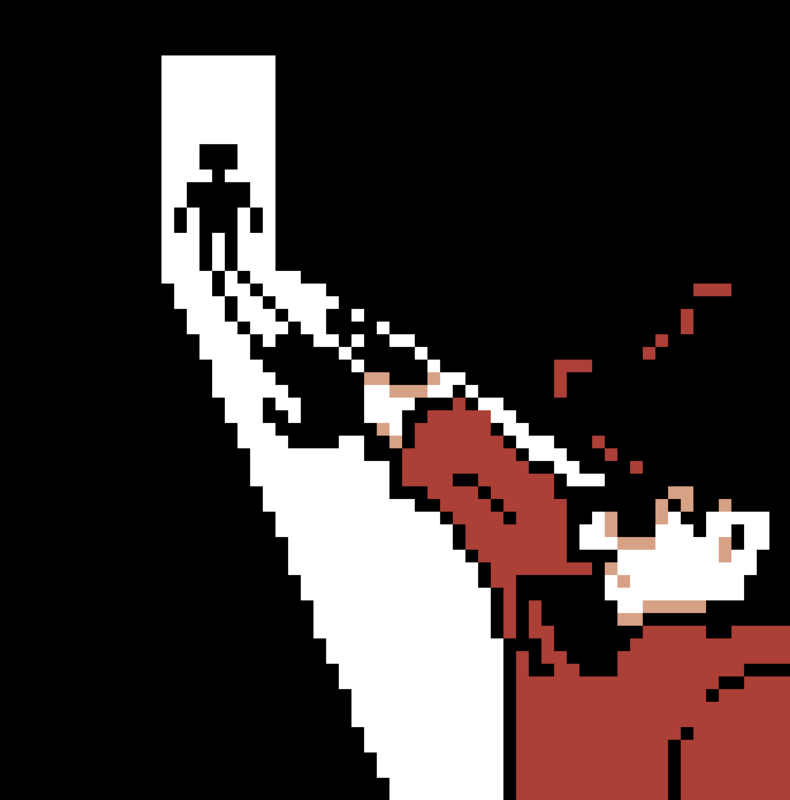 In the red ending, the agent shoots you in the back as you exit the door. Unlike the first ending, this one has no narration to explain the events. You are simply... dead. Also known as the sheep ending. In this ending, you choose patiently and never take the gun. The agent really pushes you to take it and gives you a second chance, but you do not give in. What follows is a moral lecture from the agent. This solution is sort of a cope out, you choose not to kill hitler, but you also choose not to spare hitler. You didn't make any choice as far as killing hitler goes. Yet, this ending is really important in regards to decision making. It shows that ultimately you did have the choice of not taking the gun. It's not at all obvious, since taking the gun seems part of a cut scene. 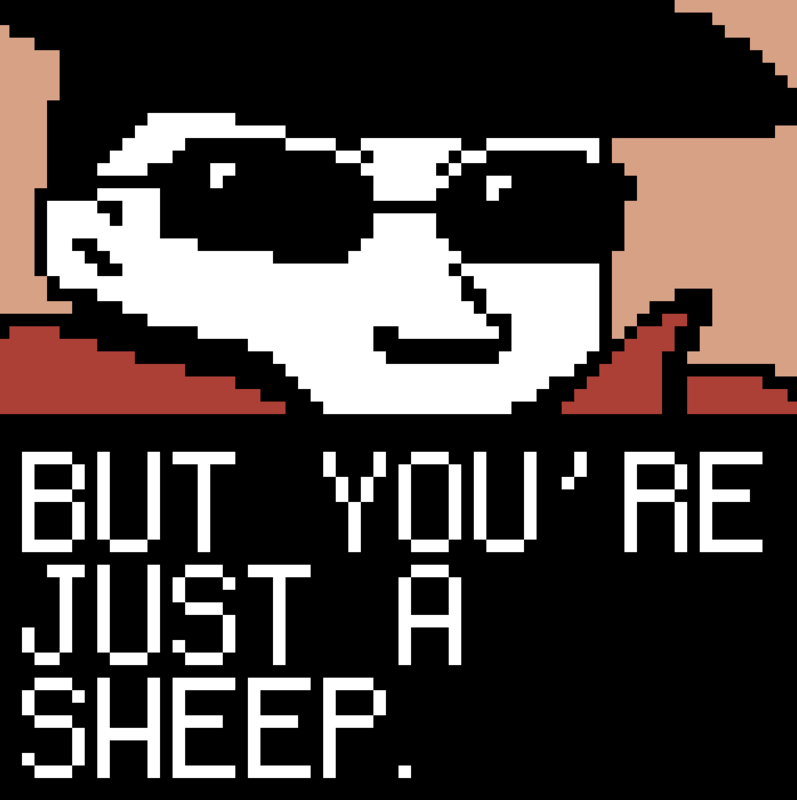 Often in video games, you do what another NPC asks you to do as if it's the only obvious course of action. This ending shows you do in reality, you have the ability to make a decision at that moment. In this ending, the agent lets you go in disgust. There's a lot of resentment, but it is not enough to kill you. So you go free, go home, and sit on your couch and watch TV. Well that's a pretty nice ending if you ask me! Now keep in mind, I really thought of this ending as an easter egg originally. So you had to finish the game 9 times with the red ending for it to happen. I tone it down to 5 because on second thought, 9 times seems a bit insane! Also I made an effort to be a bit less sadistic in my games. - With the white ending, your actions did have consequences, which is to wipe yourself from existence. Paradoxically, this also mean you could not have killed hitler if you did not exist. The white ending essentially wipes this event from existence, as if it never happened, so that's why it is the only ending the clears your progress. - The pink ending does not clear progress, but it does not advance the situation either. Since you chose not to be part of the mission, nothing really changes. You do not resolve the dilemma, you do not advance the debate. So this ending does not help towards the space ending. So now you have it. To get the space ending, you have to painfully go through the red ending five times in a row. I wished I had the presence of mind to put a skip button, but you know, when there are so many things to do, you sometimes skip the most obvious thing. Yet, I did add code to make the text scroll faster when double clicked, which shows I actually did realized how painful it was to get that ending. - You will notice a few strange things, notably that your actions do not reset. - When you put the mustache on Baby Hitler (hey I forgot to talk about that. Wasn't it funny? :-P)..., well anyway, when you put that mustache on him, on the next mission, he still has the mustache! Isn't it strange. - Also, if you shoot a the painting, the next mission shows the hole in that exact same position. This suggests that perhaps you are not just restarting the game, you are simply continuing the same story. - Isn't it strange to find a black sharpie that looks like it was made in 2019, not 1889? Perhaps a previous time traveller left it there? 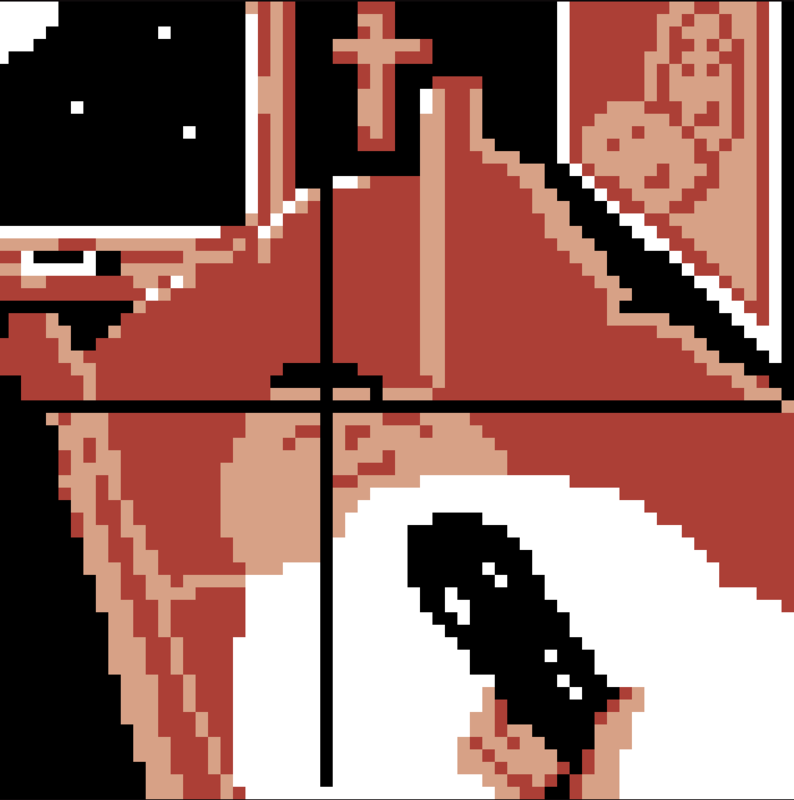 - Shooting the cross makes it go away, and it is gone the next time you redo the mission. - Another hint to show that the agency is simply continuously sending people back in time. The third person sent has a beard. (for some reason, I haven't seen a single comment about it. Didn't anyone notice?!). This means that it's a different person each time! Well, the idea wasn't for the player guess that they had to die 5 times in order to get the final ending, but to encourage them to keep coming back. If you did something over and over and nothing changed, you would be less encouraged to continue. In this case however, things do change. One thing that is not very noticeable, is that the time machine actually looks slightly different whenever you take it. In fact, one of the display is supposed to show a counter increasing (11, 12, 13, 14, 15). Of course, with so little pixel it was hard to put clear numbers, but if you noticed that something was changing, that's what it really meant. But let's talk about that final ending. You find an alien in the corner of the window, and as you try to shoot it, it starts speaking to you in foreign tones, going through several different languages before finding English. You will notice that the alien is glowing in very strange way. I originally planned to use some smart algorithm that would flash the 4 colors (black, pink, red, white) to match as close as possible a color that isn't part of those 4, by using proximity matching. That's why if you look for the PNG assets loaded in the game, you'll notice that the alien has completely different colors from what is shown in the game. I recolored it dynamically in-game. (In fact, I also had to recolor the red for all images because I originally had all my assets use brown instead.). Well at the end, the sparkling was a disaster, but it's ok, it made it clear that the alien was really special. Another thing that makes the alien special: That creature breaks the 4th wall! The arms are over the black bar underneath the dialog, which is part of the UI. Also, when the protagonist says: "If I kill hitler, I create a reality for 2019 that doesn't exists, thus I vanish. ", the alien points out that he's not supposed to know that. That's true! In the protagonist's reality, it has never happened. All that to show that this alien... is really out of this world! This is a great ending, as you not only avert from dying, you also take the baby which essentially prevents World War 2 (supposedly), and you get to travel in space with a baby who could possibly become a psycho killer in the future. Now you might ask the question.... hey how come I didn't vanish after taking baby Hitler away from his home? Didn't this have the same result as killing him? Well.... yes and no. I mean, think of the concept of butterfly effect. Perhaps it's the killing vs no killing that made a difference... and the chain of events still made your existence possible in the second case OR perhaps you cannot be YET wiped out of existence, since it has not been confirmed that you have changed history (yeah, you could still bring back hitler to earth 20 years later and put him back to Earth to let him screw up the world). OR perhaps... it's possible... the reason killing him originally caused you to vanish, is simply the fact that you are his descendant! More questions than answers :-). So one last thing about the space ending. I don't know if anybody will ever notice, but the music is a cover of the soundtrack of a French movie called "La soupe aux choux". A funny movie about an alien that lands in France and discovers the deliciousness of "soup with brussel sprouts!" (not sure if it's exactly brussel sprouts, it's something like cabbage soup.). I can tell you, despite the fact that French food is generally delicious, I don't think there's really anything special about "Soupe aux choux", but after watching that movie I was salivating at the idea of eating it. Hope you liked the game, and that reading this post helped you understand all the thoughts and effort that was put into it. The game is finally complete!